In a year that was known for social and environmental protests, one voice rang out for the people of Chile, Nano Stern. A superstar in his home country Nano performed to over 180,000 protestors whilst his new single La Ruta Esperanza became the theme for their dissent. Returning to Australia this March, Nano Stern & The Sindicato will take to the stage at WOMADelaide, Brunswick Festival [Melbourne] and for his own show at the Camelot LOUNGE [Sydney]. Named “One of the most in-demand international artists on the domestic festival scene” by Tony Hillier [Rhythms 2011] Nano Stern has brought Australian audiences to their feet from his first visit as a solo artist in 2008, and is a confirmed favorite at folk and world music festivals across the country as well as his own sold out shows. 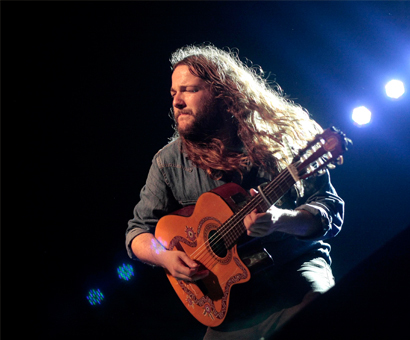 Credited as being a creator of the new Chilean sound, Nano Stern sings predominately in his native Spanish, effortlessly weaving compelling messages between each song during his live sets and always leaving audiences captivated with his English storytelling. Nano Stern has gathered a faithful following by developing his career through talent, sheer determination and the unwavering belief in himself and the power of music. As his star continues to rise in Australia, now is the time to see this talented musician - one destined to be a major influence in the ever-evolving and growing realm of world music, worldwide. In May 2011, the Chilean government approved a plan to dam two rivers in Patagonia for hydroelectricity, sparking widespread protests across the country. The first single from Stern’s fifth album Las Torres del Sal was adopted as the song of the ongoing environmental protest movement and Nano performed in front of a crowd of 180,000. He is much loved by the people of Chile. "Thus Nano Stern has won the people, with songs that balance great arrangements, vivid poetry and epic melodies, delivered with an honest and volcanic attitude worth admiring."